Are All Other Religions Wrong? Christians are not as intolerant as you might think. Are atheists more tolerant than religious people? Are Christians intolerant of other faiths? Why is it that Christians believe that Buddhists, Hindus, Pagans, Native Americans, etc. are all wrong in their beliefs? It generated quite a bit of discussion. This question makes a lot of sense in our culture. We find Christians, indeed all those who take their faith seriously, as judgmental. When we accept that there is no God, as many in our culture have; tend to also abandon the idea that there is a universal purpose and meaning–we are uncomfortable with, or reject, the idea of objective truth. We’d rather create our own truth. That’s why Christians baffle people like kittythedreamer (“kitty”). Christians have this old fashioned idea that truth is objective, rather than subjective. We believe that some things are true, or moral, or good, or just, whether we like it or not. It follows then that some things are false, immoral, evil, unjust. In our culture, saying someone’s views are wrong is the same as telling them that they have the wrong favourite ice cream. “kitty” is right; Christians do say others are wrong. They do so because when they claim that some things are true, they can’t also accept the opposing idea as also true. To do so requires a mental dexterity possessed only by those who don’t believe in objective truth–those who create their own meaning. We’ve already covered the first one. All, or very nearly all, of the world’s religions believe that truth resides outside of the individual. They don’t entirely agree on what that truth is, but it’s external. External often means universal–that means it’s true for everyone, everywhere, for all time. One of the things that humans are supposed to do is conform themselves to that external truth. So rather than thinking everybody is wrong, Christians believe that, in this respect, that these religions are right. Another thing that nearly all religions believe is that behind the natural world there is a mystical and/or spiritual reality. 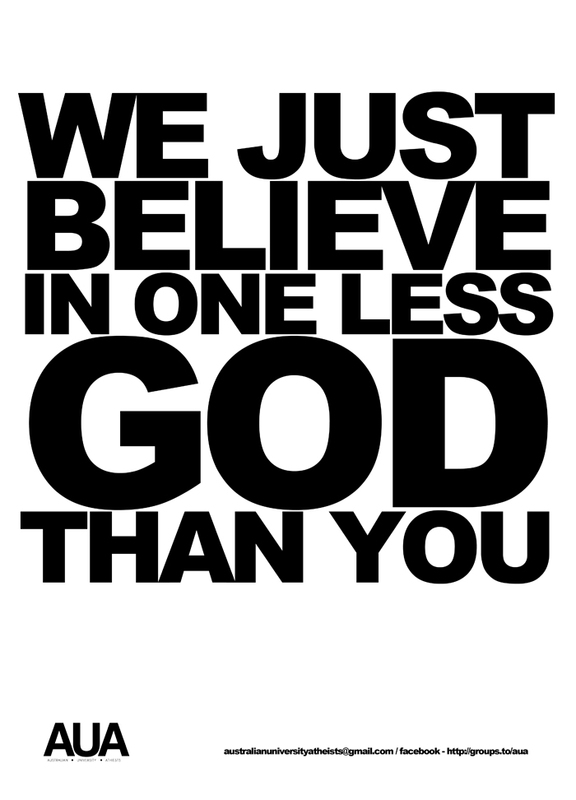 Most of the religions of the world, past and present, believe in transcendent gods or a God. Christians believe that, in this respect, all those religions are right. Most religions believe that God or the gods is/are occasionally active in the lives of humans. Christians believe that, in this respect, all those religions are right. Many religions believe that God is interested in human flourishing. Christians believe it and any other religion that believes it too are considered to be right. All religions believe that human beings must contend with evil in their lives. Christians believe this and they agree with any religion that believes it too. Many religions believe that other religions possess truth. Some are closer to “The Truth” than others. Obviously, Christians don’t believe that other religions are wrong. There is tremendous agreement among religious adherents. This is not to say that the differences aren’t significant, but the points at which all, or most, religions agree might give one pause. So who is more open-minded? 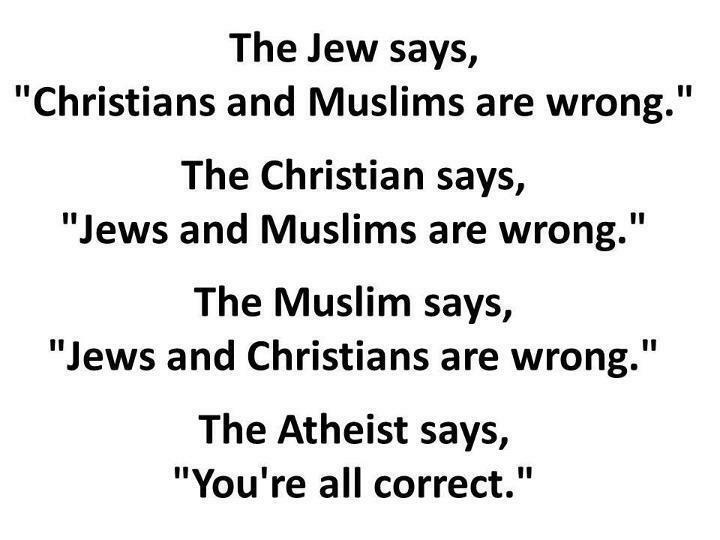 Does the atheist say, “You are all correct”? I know it feels like there is a lot of conflict between Christians and others in our society. Not all of it can be reduced to closed mindedness and bigotry–some of it has to do with the fact that people of faith look to a source of truth outside themselves. Their claims might not be true, but it must be admitted that the idea that all meaning is necessarily internal also has some significant drawbacks that make it hard to believe. This is where the dialogue should begin, not with kitty’s question. Some people refer to Easter as “Zombie Jesus Day.” I’m guessing they are being provocative or trying to impress their like-minded friends. Perhaps it is because of this attitude that Christian writer Eric Metaxas has taken the position that zombies are a parody of the resurrection of the dead. I think zombies are much more than a parody, and they can be part of a gospel conversation with our children and even with our unchurched neighbours. Zombies turned up in popular culture about a century ago, but they really took off with George Romero’s Night of the Living Dead (1968) and they’ve been going strong ever since. Why this popularity? The simple answer is that there is something about the zombie horde that resonates with our culture. Given the popularity of zombie narratives, it must be resonating a lot and has done so for almost fifty years. Why? 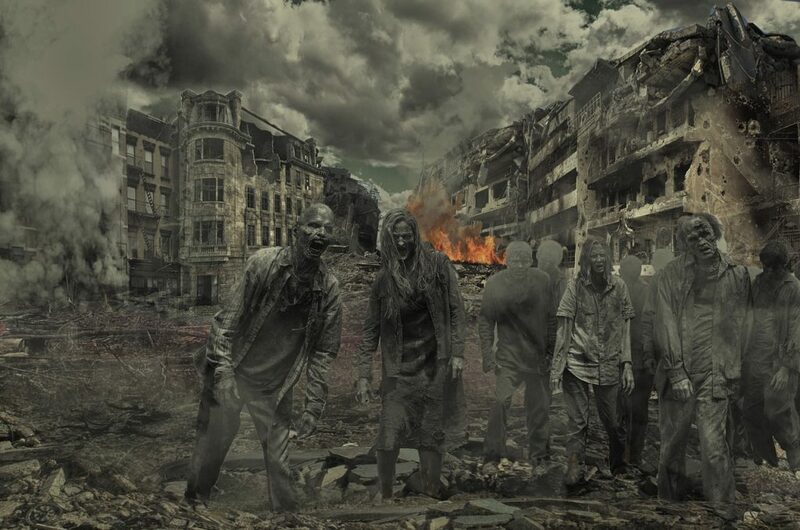 The popularity of zombies is due to the popular belief in our culture that we have outgrown Christianity and that materialism is probably true. By materialism I mean the belief that reality is material, and only material. There’s no room for the spiritual – no such thing as God or the human soul. We are human beings, so we have first-hand experience with what one is. We know how human beings respond to a beautiful waterfall. We know what it means to fall in love and we know what it means to be very, very sad. We not only think thoughts, but we can think about our thoughts. Is any of this possible if materialism is true? Even in a secular society, there is enough in this question to cause some doubt. Monsters turn up when we have doubts, and they keep coming back until they are dealt with. With the popularity of the zombie, we know that there are some doubts about being human in a materialist context. If there is no spiritual dimension to reality, would we respond to beauty as we do? Have emotions like love? Could consciousness signify that a human is more than matter? If materialism were true, wouldn’t we be zombies? Are we zombies? [tweetshare tweet=”Paul argues against zombies in 1 Corinthians 15:35-44. ” username=”Dryb0nz”]The error of Paul’s audience reduced the essence of humankind to spirit, where modern materialism reduces man to mere body. Paul says that you will get the resurrection all wrong if you fail to understand that a human being is both body and spirit and that the resurrection will be of the whole person. When Jesus rose from the dead he had a new, resurrected body. This is what Paul’s audience needed to understand about the resurrection. Paul’s words to the church in Corinth apply to our culture as well. We need to understand that Jesus wasn’t just reanimated body, but a heart and mind and spirit as well. Consequently, he was nothing like a zombie. And rather than eating living human beings, Jesus was satisfied with eating fish with his friends (Luke 24:42-43). This is very unzombie-like behavior. It is clear that in AMC’s The Walking Dead TV series, one would rather be truly dead than one of the “walkers.” A materialist resurrection is much worse than the nothingness of a materialist death. Disrespectful internet trolls aside, I don’t believe that the zombie apocalypse is a parody of the resurrection of the dead; I believe it is a lament that resurrection isn’t what it used to be before we grew out of our belief. The gospel message to the zombie culture is that human beings haven’t changed. We have always been a lot more than our material bodies and we still are. Our need for salvation has also not changed – there are no true zombie movies that don’t clearly present the truth of human depravity. The good news is that the God who made us with not just a body, but a heart and a soul and a mind as well, loves us so much that he redeems all of me. Jesus wasn’t a zombie, and neither am I. This is the comprehensive resurrection we celebrate this Easter. A version of this article was first published for The Christian Courier at christiancourier.com.